Old Main was the University of Arizona’s original building and has served as the heart and soul of campus. 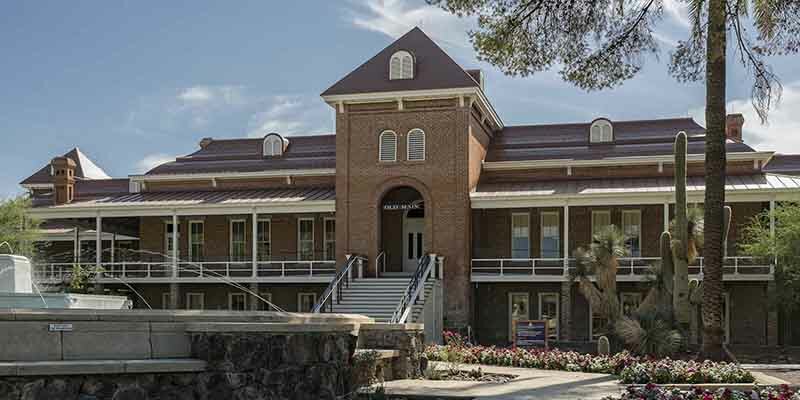 Located in the center of the UA mall and with long vistas to the east and west sides of campus, Old Main is certainly the most recognizable physical icon for the University of Arizona. After 122 years of use, and little or no state funding for building renewal, the building’s envelope/structure, verandas and second floor had succumbed to the advances of age and weather penetration. The exterior unreinforced masonry columns settled and became worn and cracked. The wooden structural elements decayed and foundation walls spalled from wicked in moisture. Fire protection and HVAC systems were well beyond their useful life. This project restored the building to its earlier conditions and prominence by fully respecting the historic character and fabric of the original building, while creating modern function and safety and significantly extending the buildings useful life. Modern and efficient systems were carefully woven into the building to preserve the original volumes and aesthetics while adding much needed functionality. Failing and unreinforced structural elements and systems were replaced and creative means were used to bring the building into compliance with modern building, safety and accessibility codes. The historic character of the building was restored, the years of decay reversed, and the useful life of the building was significantly extended for future generations. This historic icon will remain on the National Register of Historic Places as it was renovated and preserved in compliance with the Secretary of the Interior’s guidelines and administered by the State Historic Preservation Office.